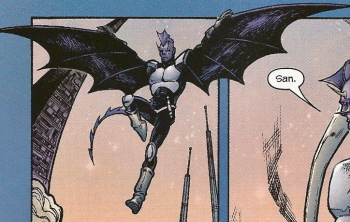 Powers/Abilities: After passing through the Terrigen mists, Senschi developed purple skin, a spiky finned ridge of hair, a taloned face, a long spiked tail, and large purple wings allowing him to fly. The full extent of his powers and abilities remain unknown. History: (Inhumans V#1) - Senschi summoned San to visit Black Bolt for a special mission to Earth. (Inhumans V#2) - Senschi summoned Tonaja at one of the highest points of the city to attend to see Black Bolt. He told her that he often watched the lights over the city as well.